Get rewarded for free. Simple as that. You know that old saying, "you can’t get something for nothing"? Well, no fee cash back credit cards seem to shatter that theory. Cash back with no strings attached. And assuming you’re paying your bill on time, and avoiding any pricey interest fees, you’re getting that cash completely free. When it comes to perks and benefits, you usually get what you pay for: higher annual fee = more perks and rewards. when you already have a premium card and you’re looking for a card to pair with it. Plus, sometimes free is just a straight-up no-brainer. Review all 10 top no fee cash back cards here. Just because you’re opting for a no fee credit card, you don't need to forgo all the fancy perks that premium credit cards offer. So, when looking for a no fee credit card, it pays to shop around – no need to settle for just any card. 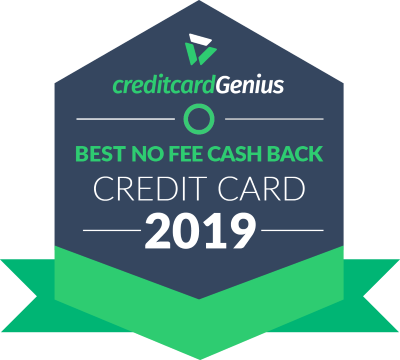 The best no fee cash back credit card award goes to the . Why? It's all in the earn rates. Get 1.75% cash back on all of your purchases. No other no fee card can come close. Plus, earn 2% cash back on Rogers products, and get 4% cash back on any purchases you make in a foreign currency. And, redeem your cash back against any purchase you make that's over $20. Add it all up, and Rogers has a winner. The downside to this card? It has high income requirements – $80,000 personal or $150,000 household, something no other card on this list has. If you can't meet them, one of the other cards will be better suited for you. The definitely stands out amongst its competitors because it works a little differently than other cards. It allows cardholders to choose which categories they can earn higher cash back rates based on their spending habits. Here’s how it works: You get 2% cash back on up to 3 spending categories you choose. That means if the biggest chunk of your budget goes towards gas and groceries, you can earn 2% cash back on gas and groceries. And one of the best parts? You are able to change your categories if your spending habits change. So, if you buy a bike, and gas is no longer one of your expenses, you can easily change that category to restaurants, or entertainment, or something else. The best American Express cash back card in Canada right now, coming in as a really close second, is the . You’ll earn a solid 1.25% cash back on all purchases. Plus, for the first 3 months, you will get 2.5% cash back (up to $150 earned) – that’s $75 more than you’d normally get. And, as an added bonus, this Amex card will also give you a referral bonus of $100 for any approved referrals you send their way (up to $1,500 annually). an introductory balance transfer rate of 1.99% for 6 months. The best Visa card on our list, the , has a lot of things going for it. This card offers cardholders 1% cash back on all purchases – no limits, no restrictions. And while that's pretty nice for a no fee card, that isn’t even where this card really shines. Not only does it offer cardholders complimentary (though slightly limited) roadside assistance, but it also has no foreign currency exchange fee – and for the world-traveler and online-shopper alike…that 2.5% in savings is a pretty great deal. Check out our complete list of the top 10 best no fee cash back credit cards, so you get the best of free there is.